Want to do something really cool and different for Halloween. How about giving out mini comics instead of treats. There are now packages of 25 mini comics that you can purchase for 5 dollars. Meaning that if I took the 60 dollars I normally spend on candy I could purchase 12 sets of 25 or 300 mini comics. In my opinion that is extremely affordable. The comics are being offered as part of Halloween Comic Fest festivities. To get them you need to fill out the order from from the Halloween Comic Fest website then take the form to your local comic store that is participating in Comic Fest. They will place the order for your and have your comics ready for you when you show up for comicfest. I do not know how many stores are participating and how long it takes to get the comics this is something you will need to discuss with your local retailer. This is another way where Comic Books are finding some brilliant synergy with Halloween. A free comic book day where kids can wear their costumes, get free comics and enjoy the festivities is already awesome. 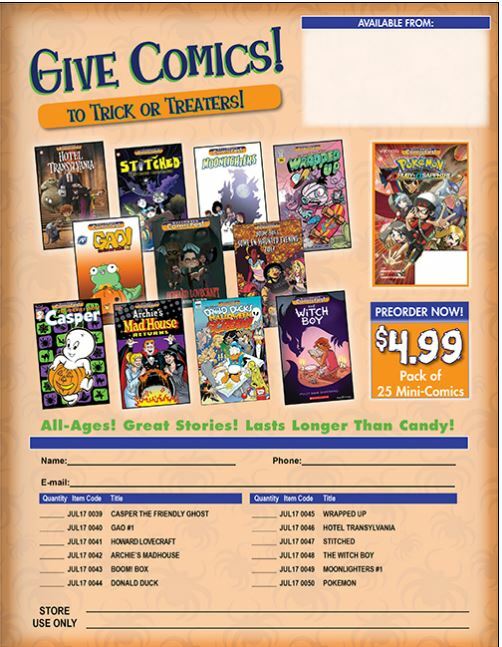 Now with the addition of these mini comic bundles the comic industry can enter the mainstream Halloween Treat market. In addition to helping the comic industry by buying comics, this has opportunity of making thousands of new comic book fans. Every comic collection has to start somewhere. I like this idea in part because I think kids end up with way too much candy anyways but I hate to be the house giving out something lame like tooth brushes. This is way to give out something that is fun, cool, fits with Halloween and is not Candy. It also comes with the benefit of helping teach children how to read. I really see these offers as a win win for everyone. There are also a bunch of fun looking titles like Howard Lovecraft and Witchboy.